Nature's Path Mmmaple Pecan granola bars: You had me at "sweet and salty!" I'm not known for my planning or time-management skills [at Disney on Ice (yes, we were late,) when the skaters came out for the ballroom scene, Z kept asking where Cinderella was. When she arrived, Z said "Oh. She's just late. Like us!"] so often my breakfast is just whatever chewy bar is within arm's reach as I bundle the kids out the door. Ak-Mak cracker bread: These taste really good with some herb cheese spread Hubby just got. Perfect timing! Osem Israeli Couscous: Apart from my sheer enjoyment of any excuse to say the word "couscous" ("Hug hug couscous!") this will make a nice alternative to regular noodles or rice. And it's easy for Baby to eat. Win! Seapoint Farms Dry Roasted Edamame: I had just used up the last of the dried edamame for my salads a few days before this arrived! It's like she's in my head! Betty Crocker Simply Fruit roll-ups: These are the only thin fruit leathers I've seen. All the rest are thick and smallish, so only good for cutting small shapes from. Yes. I'm always thinking in terms of how any given food would work in a bento. It's a curse gift. This is my first month sending to another blogger, so you can check out what I sent to Katie at Wish and Whimsy! 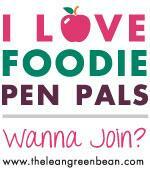 December's Foodie Penpals will be for charity instead, to help make the season a little brighter for the survivors of Hurricane Sandy. Look for the link to donate at The Lean Green Bean on December 3-7! WOO HOO seems like you are enjoying the box. I was so not sure...but I also wanted to send things the kiddos could enjoy! What you got such wonderful foodie treasures!